I always ask players what tournament they've had the most fun at. If someone were to ask me what interview I've had the most fun at it would have to be the one I did with Reka Zsilinska. Her energy far exceeds anything I can get from Starbucks and I enjoyed every minute of it. 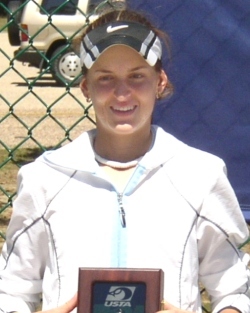 Fifteen year old Reka Zsilinszka may not have earned seeding at the USTA National Spring Championships, but she certainly earned her way to the top in 2004. She finished the year ranked No. 1 in the USTA Girls' 16s after winning the Florida Open and a National Open, as well as placing in the K-Swiss Championships, USTA National Hard Courts, Chanda Rubin Evert event and USTA International Winter Championships. The previous year she was No. 4 in the Girls' 14s, with wins at the Super National Hardcourts and showed up in at least the final eight of the Gator Bowl, the Super National Claycourts & Hardcourts (Doubles), the Chanda Rubin Van Der Meer and the Eddie Herr International Chamionships. For unseeded Reka, the USTA Spring National Championships was quite the tournament. She was the surprise entry in the finals who eliminated two seeded players on her road there. I sat down with her before her loss in the championship match to Lindsay Burdette, but her positive attitude was just as clear after that match.